This is not a real DIEGO VOCI PAINTING. LOOK CLOSELY.. this painting are portions of two original oil paintings by Diego Voci (see below) and two of the volunteers for the Diego Voci Project Team confirmed this as each own the original paintings. 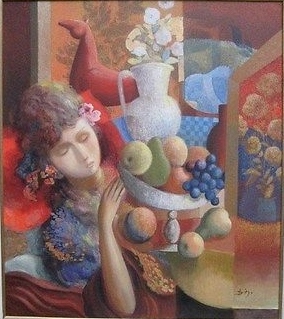 Here are the ORIGINALS OIL PAINTINGS by Diego Voci so you can see for yourself! Imagine finding a #treasure like Brad did online. Keep a lookout…a couple of thousand Diego oil paintings are scattered around the world. Our DVP team just found a treasure in #Lithuania. You never know where you’ll find your’s! If you enjoy this video, simply enter “DIEGO VOCI” into your search engine and go! This masterly rendered canvas by internationally collected artist Antonio Diego Voci (1920-1985) is titled Jeunes Filles a la Fenêtre (Young Girl at the Window). It was purchased by Eugene Pizzo Jr. in Spangdahlem on August 7, 1980 for $940. This is one of a few thousand Diego works (including drawings) still scattered around the world. Here is just a sliver of Diego Voci collectors who own Diego’s African works of art. An opportunity to buy one for yourself Diego Voci (1920-85) Original Lithographie Composition Africane Mit 60 x 80 cm (direct link to ebay). Google Diego Voci, click images see Googles’ selection of Diego’s works of art. A Nice Painting by Diego… will sell within 4 Hours! 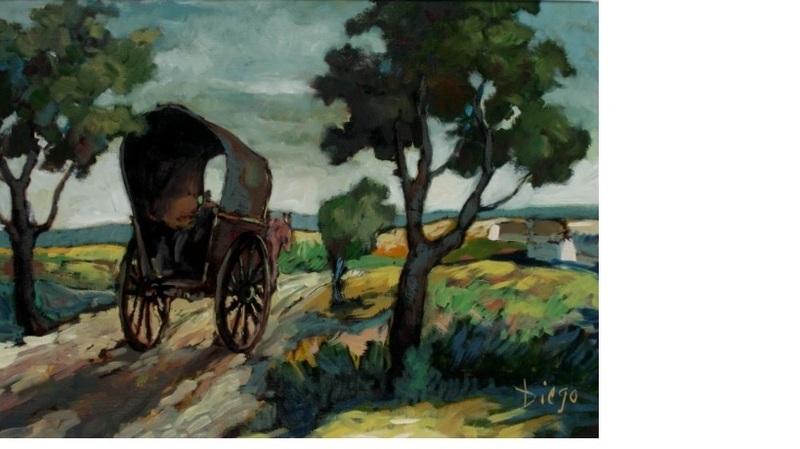 Although the Diego Voci Project has no connection to this ebay offerring, we just spotted it and as this is posted it has 4 hours go go. It is an authentic Diego work of art from the 1970’s. The time to buy a DiegoVoci™ painting is right now while there are more sellers than buyers. That will change. Remember when houses were so cheap a few years ago? The people who took advantage got anywhere from 30% to double their money today. Buy low. Sell high. The DiegoVoci™ owners of 30 and 40 years ago have passed or are dying. Owners literally hoarded 4,000 Diego oil paintings since Diego’s death in 1985. Yet DiegoVoci™ was unknown to the world’s art market. The paintings are showing up in yard sales, thrift shops, auctions, and eBay ranging from 97¢ to $1250. Some are quite good. One or two not as good. It’s all in the eye of the beholder. This canvas (painting above) is good. The new owner bought it at a garage sale for an amazing 97¢! You should be so lucky. 1. As people like you find the bargains, the supply will get tighter. 2. The demand will rise also because of the work being done by the volunteer Diego Voci Project Team to enhance awareness and value of Diego’s great body of artwork. Get busy! Google “Diego Voci” while the buys are hot. The bottom is now. The sky’s the limit! Go to www.diegovociproject.com to purchase a DiegoVoci™ painting. Up for auction was this charming oil painting signed DIEGO described as a countryside landscape scene in Germany. The painting measures 23 1/2″ x 31 1/2″ and the frame measures 30″ x 38″. The frame indicates the original purchase was from Naffouj Gallery in Landstuhl, Germany.